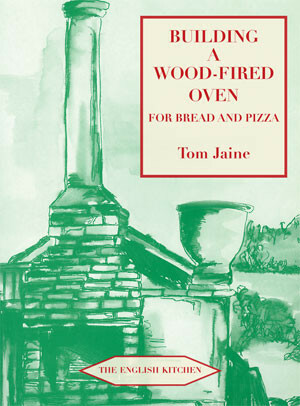 • The book sold, and ovens built, around the world •Prospect Books’ best seller is this handy instruction manual for the ultra-keen breadmaker and DIY enthusiast showing how to build a substantial bread oven in the yard or garden. Together with detailed plans (which do not omit a single block or brick) and a step-by-step specification, the book doubles up as an essay on English bread baking in previous centuries, with special reference to the hardware, equipment and working methods. There is plenty here to interest the reader who is not necessarily going to embark on the building project.The book was first published in 1997 and has had an annual printing since then. It sells at much in America as it does in Britain, although British sales have definitely increased in the last few years. There are other books on the subject, but few give as much historical context. The history of bread is something which is almost entirely ignored in current literature, greatly to its disadvantage. The book closes with a couple of recipes. It was never meant as a cookbook; there are plenty of alternatives, including the same author’s Baking Bread at Home (Phoenix). But the enthusiasm for good bread, and for baking it yourself, is still growing and is well served here. Tom Jaine is the publisher at Prospect Books, which he has run since 1993. He has been a restaurateur, an author of cookbooks, editor of the Good Food Guide, and editor of the revised edition of the Oxford Companion to Food. A PDF of the preliminary pages and sample pages from throughout the text. This review is from an older edition of this book. This is the gift for the man who has everything but moderation. It addresses the unflagging pursuit of excess, typical of both the DIY enthusiast and the militant foody. Though these two usually have little in common, Building a Wood-Fired Oven for Bread and Pizza, by Tom Jaine, a former editor of The Good Food Guide, provides the satisfying pleasure of unexpected but complementary ingredients well combined. All of us whose first efforts at baking fell from the tin with the weight and texture of a well-formed brick have some sense of a relation between baking and building. But Building a Wood-Fired Oven for Bread and Pizza establishes a more enduring connection. It first tempts the adventurous cook with recognizable lists of implements and ingredients mixed with recipes, quotations and illustrations from modern and antiquarian texts. Only the brave should go on, however, as standard implements turns out to include cement mixer (optional), lump hammer and ‘spirit level (for level and plumb)’. This list further probes the confidence of a cook-turned-builder by ending with one of those throwaway lines whose vagueness always unnerves the amateur in the kitchen: ‘Various tools for carpentry (for making the roof – optional)’. Compare the standard ‘suitable fresh herbs for garnish as required’, which has no doubt flummoxed many a mason at the stove. The cook who perseveres will find more that is familiarly unfamiliar in the main recipe, which begins, ‘Builders’ sand, 3 tons, Combined aggregate for concrete, 2 tons, Hydrate lime 3 x 50kg bags’. You might just add water and stir. Things rapidly become more complicated, however. But those who last to the final brick course will find two worlds fold seamlessly into one with the advice (optional) of John White (1828): ‘Procure some bullocks blood, newly drawn, mix as much lime powder in the blood as will bring it to the consistence of a thin paste, then dip the dressed stones or bricks, one by one, in this paste and lie them in their regular course, till the whole is finished.’ Serve, no doubt, with a hearty Hungarian red. In the age of the antiseptic little bread machine, we should no doubt cheer someone who offers something so much more substantial. As Elizabeth David once regretted, ‘even the most unskilfully made bread smells good’, and it surely takes more than these rewired toasters to make a tasty loaf. But a 2m x 2m x 2.5m mausoleum-like structure (to be finished with either ‘classical’ or ‘Mohammedan look’) perhaps swings too far in the opposite direction. Yet clearly Jaine has as little interest in compromise as in practicality. Indeed, how could such things worry someone who fires his own oven ‘after lunch’ (presumably a cold collation), in order to reach baking temperature around midnight. It is only on reflecting that ten hours stoking is a lot of effort for one pizza that the author recognizes the possibility of excess. But he cheerily offers a ready solution: ‘a pizza party is the obvious answer’. Here you are left with the daunting picture of chummy DIY-ies and foodies in the garden at 1 a.m., befogged by wood smoke but tirelessly building, then eating pizzas while complimenting the pesto, sun-dried toms and minaret on top, and the plumb damp course, ash pan flashings and thin crust underneath. An ideal gift, perhaps, but choose carefully which neighbours you give it to.